Envelope from Carrie Winter to her Fiancé Charles Kofoid to represent the 300 letters that were transcribed for the book. A sample of the letter before transcription. The yeild was close to 800 pages of wordprocessed pages, ultimaly edited to just over 300 pages in the book. The Kofoid Papers are held at the Scripps Institution of Oceanography Archives, UC San Diego Libraries and include some forty cubic feet of correspondence dated from 1825 to 1947. While both sides of the correspondence between these lovers were found intact, this book presents only the letters written from Carrie to Charles during her years in Hawai'i from 1890–1893. Once painstakingly transcribed, the letters yielded too great a quantity for a single volume, so the editing decision was made to narrowly focus on Carrie’s Hawaiian experiences, particularly those around Kawaiaha‘o Seminary. Most passages of family news from Connecticut and gossip about classmates and events at Oberlin College were omitted. Also eliminated were the lengthy portions of the letters discussing Charlie’s social life and his educational pursuits. Also reduced were Carrie’s substantial and intimate passages of love and longing for her fiancé. Every effort was made to accurately and faithfully represent the original letters in transcription. To this end, no grammatical errors or spelling were corrected with the exception of names of well known people (e.g., Cooke from Cook) and a few historical places. The chronology of the paragraphs within the letters and of the letters themselves, are placed in the same order written. Carrie’s handwriting is so closely spaced that it was sometimes difficult to identify paragraphs. For clarity, some sentences needed to be shortened and paragraph breaks inserted. The Index, entitled “Who’s Who in Miss Winter’s Letters” was an overwhelming undertaking. The quest from the start of the project was to identify every individual mentioned in the letters. In order to make the task less daunting, it was divided into three manageable sections. It was decided to classify the master list broadly into three broad groups; the white elite, the Christian teachers and workers, and the girls of Kawaiaha‘o Seminary. Of the three, the easiest group to accurately identify was the white American elite that dominated the economy in 1890 Honolulu. Much has been published about this influential group and the only challenging aspect was that many of these individuals intermarried and shared the same last name. Following nineteenth century protocol, Carrie referred to adults in this group by last name only (e.g., Mrs. Cooke, Mr. Castle), even the teachers she lived and worked with. This necessitated looking at people in context and checking against other sources when possible. The second group consists of missionary teachers and church workers predominately from the United States. Marriages changed the names of many teachers which made identification a challenge. Biographical sources including Notable Women of Hawaii and Men of Hawaii, were essential in adding to the profiles of this group. Steamship passenger lists published in newspapers often provided first names or initials of the teachers arriving and leaving Honolulu which aided identification. 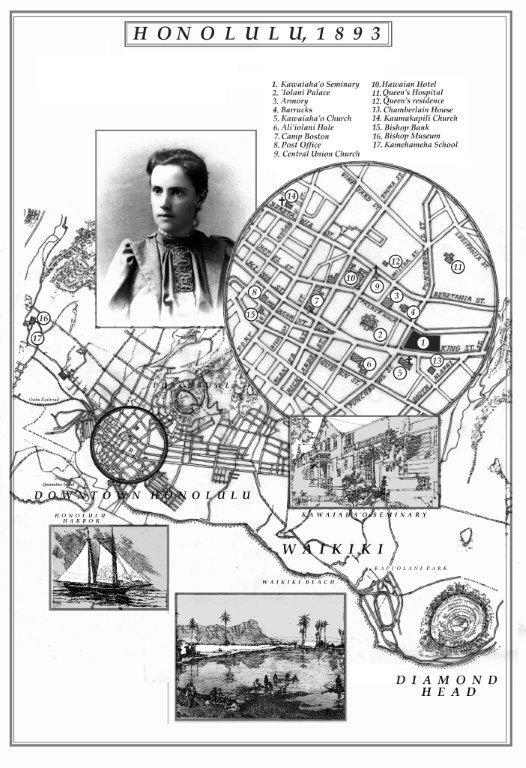 Thankfully, Carrie sometimes mentioned the college, business, family and home towns of these individuals in her letters which aided in discovery. Since many in this group were associated with American colleges and seminaries, checking names against college biographical directories and alumni reports facilitated the successful identification. Oberlin College Archives, in particular, yielded class files, photographs, and collections with abundant information on Kawaiaha‘o’s teachers. Most notably is the Lilla Estelle Appleton Papers that includes a transcribed journal and correspondence that corroborated Carrie’s account of several social and political events. Appleton’s family offered copies of photos from a rare photo album to further this project. Many school and student photographs of the school, students and historical sites included in this book were taken by Appleton, an accomplished amateur photographer. Kawaiaha‘o’s students comprised the third group and this was the most complicated to research for a number of reasons and admittedly, this undertaking is still underway. The task began by compiling a list of all the students mentioned anywhere in Carrie’s collection and this master list ultimately yielded 97 names. Carrie mainly used only the girl’s and some of these were spelled phonetically and at other times, diminutives used (e.g., Konie for Konia). The Hawaiian name of each student was rarely used and sometimes different spellings were provided for the same student. Identification sometimes became a judgment call, based on either three or more facts collected from credible sources. Almost all names were checked on worldwide genealogical websites, most notably, Ancestry.com. The searches yielded significant results when names matched and families who responded were able to verify their family member was the same one in Carrie’s letters. When this fact could not be conclusively verified, but the biographical information left no doubt the person was one and the same, relatives assisted in providing the correct Hawaiian names. Many of these families freely shared their personal documents from family Bibles, genealogies, marriage and death certificates and treasured photographs with histories to match. Student names were also checked in the Friend and other periodicals of the time as well as reports of the Hawaiian Evangelical Association (HEA) and annual reports of the Hawaiian Mission Children’s Society (HMCS). These publications reported on school events and activities which sometimes yielded the full and correct name of Carrie’s students. Reports of the HEA were also a helpful source of information on the parentage of the students who were daughters of clergy. Materials on these organizations held at the HMCS include unpublished principal and trustee reports about the seminary as well as handwritten letters of appreciation from those students whose tuition were supported by the Cousin’s Society. Two important holdings at the Mission Houses Museum Library included an 1882 Circular for Kawaiaha‘o Female Seminary that was helpful in finding the full names of some of the students that were still in attendance by 1890. The second one was a rare school photograph taken about 1888, reprinted in the book, which actually matches name to face. Identifying the ethnic identity of each student took on a life of its own. Some girls identified their own ethnicity in their autobiographical essays printed in this book. In other cases, the personal genealogies from family members aided the task. Marriage records searched at the Hawai‘i State Archives sometimes stated the ethnicity of the bride and groom, and census records occasionally did the same. Obituaries searched at the Hawai‘i State Library oftentimes identified the ethnicity of the deceased. Many of Kawaiaha‘o’s students went on to become teachers. This information was obtained from the reports of the education officers and authorities during the monarchy, provisional government, and territorial government at Hawai‘i State Archives. These records were an invaluable source of information yielding full names, location of teaching institutions, credentialing, and in several cases, name changes upon marriage.